This former manse to the Free Church was built around 1850 from local stone, and was recently renovated in 2005 with a new roof and internal features. The accommodation at Old Church Manse offers a well-proportioned drawing room, as well as a sitting room and formal dining room, while the bespoke kitchen in particular is a feature of the property. The rear hallway on the ground floor now leads to a contemporary shower room with a Nordic sauna. Upstairs, the first floor has a bright and airy master bedroom suite with two large windows offering views over the bay and beyond. There are three further bedrooms and a family bathroom. The second floor has an attic/games room and a home office/study. 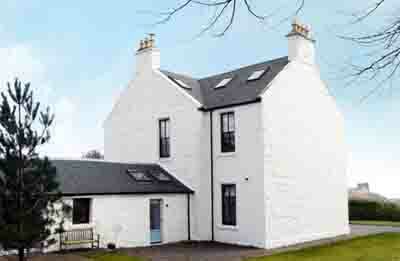 The Old Church Manse sits in just under an acre of landscaped gardens. The house is located 12 miles from Broadford and 16 miles from the Skye Bridge, on the Sleat Peninsula on the south eastern coast of the island. There is excellent sailing, fishing and diving on the doorstep and deer stalking and fishing are also to be had nearby. The guide price is £520,000. For further information please contact Strutt & Parker on 01463 719 171 or visit www.struttandparker.com.